I put this on top of Sally Hansen Model Behavior. I think the glitter goes well with the blue. I also put a top coat on the glittery nail - last photo. The last four photos are taken with the flash. 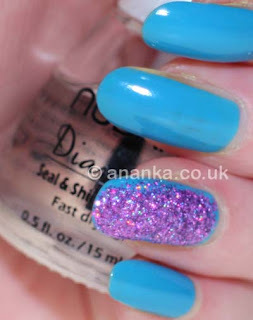 This is easy to use - just sprinkle over a wet nail and tap the excess glitter off. I usually have a little tub that I do it over so it's not messy and I can put the rest back into the bottle! This is a pretty purple holo glitter that sure does sparkle. I think the addition of the top coat did dull it down a little though. Lasted really well. 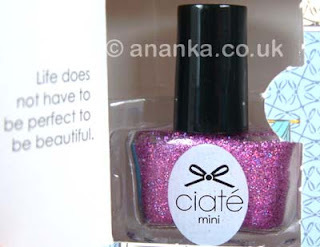 It's a pretty glitter - a very nice blend! Wow, what a lovley glitter. It looks great in combination with the blue. I love this glitter. It is so pretty. Love holo glitters! This one is not an exception. Pretty, sprarkly, what's more to want? Me too! You can't beat a good holo glitter :-D Hehe yeah!